Apart from residential use, you can transform a shipping container into a money making business. Due to expensive construction costs and an increase in interest in sustainable architecture, several small business operators are thinking of refurbishing shipping containers to house their business. With proper planning and design, these mega steel building materials are practical and cost-effective business solutions. If you want to start a small clothing boutique, a shipping container can serve as your physical store and storage. Stack a few shipping containers if one isn’t enough for your business. Planning to sell aged, rustic, and antique pieces? Give your renovated container store stunning worn yet warm interiors. The ambience will match the furniture and collectibles that you’ll sell. If you don’t want a regular retail store, be a themed store for special holidays, events, and seasons. A pop-up store will fit inside a renovated shipping container! For example, people living in coastal cities and suburbs can put up a swimwear store. It’s a perfect beach business! Make a vacant commercial lot profitable. Set up multiple shipping containers and put each stall on a lease. Invite different kinds of businesses to rent on the property. A 3D plan of a campus business centre to be constructed out of shipping containers. Are you planning to teach a small group of people? Consider renovating a shipping container to become your classroom or workshop space. Have you heard of the Photoville Festival that happened in Brooklyn this year? They used more than 60 shipping containers repurposed into galleries to house over local photo exhibits! It proves that you can use it to display the work of local artists in your community. (Including you). Books are popular with a lot of people from students to tourists. Build space-saving joinery inside your refurbished shipping container so the books won’t occupy too much space. This one is easy. For anyone running an eCommerce business today, you can use a backyard shipping container home as an office and storage facility. Are you a florist? Then, a renovated container home can be your atelier, where you can create flower arrangements. If it’s in your backyard, you even have a place to grow flowers or other plants right outside. Farmer markets, flea markets, street markets will be more suitable for vendors and customers when you provide them with protection from the sun and rain. If you live near the coast, consider a surf and diving equipment rental store. If you want a home-based business, a landscaping tool and equipment rental (and other similar stores) will work. 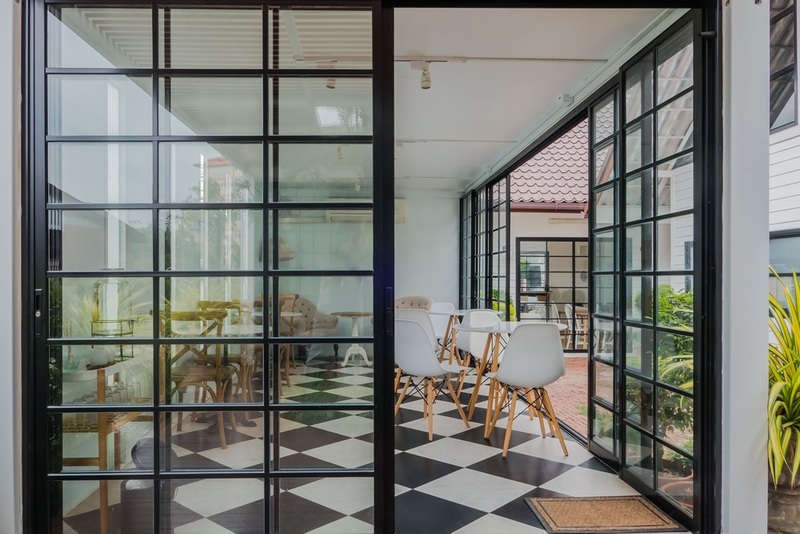 Restaurants in refurbished shipping container homes are one of the hottest trends in the food and beverage industry. When you group these container restaurants in one lot, you create a Food Park. It’s a hit in some Asian countries. 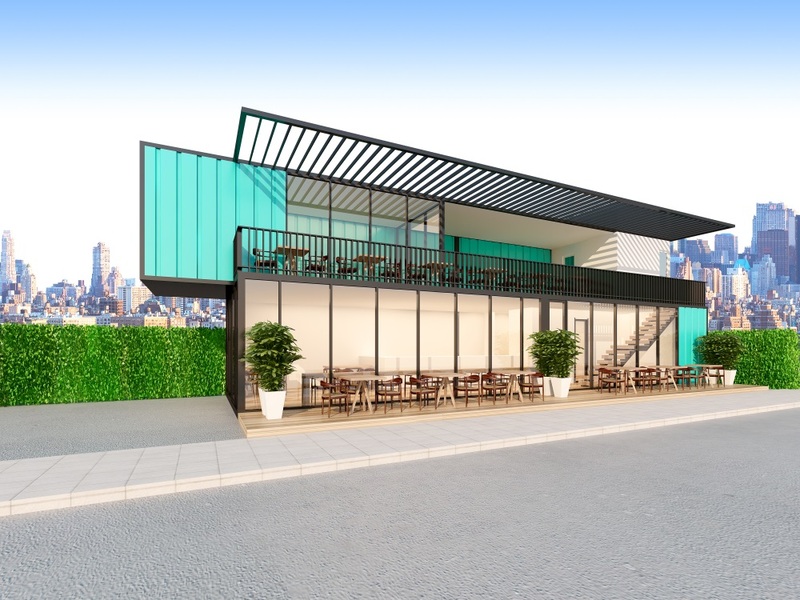 A 3D plan of a shipping container restaurant. I’m sure you’ve heard of meal preparation businesses already. It’s a trending business that attracts a lot of busy people who want to stay in shape. Instead of doing all the work in your kitchen, how about you build a small space where you prepare meals that you directly sell to consumers. Another thing you can do is to build a rentable space out of shipping containers and make it suitable for small dinners or parties. Or, you can open a small bakery where you can sell your special home-cooked bread and pastries. Set up a few seats for a perfect alfresco dining. A bakery provides a covered seating area for their student customers. Want to brew the best coffee in your area? 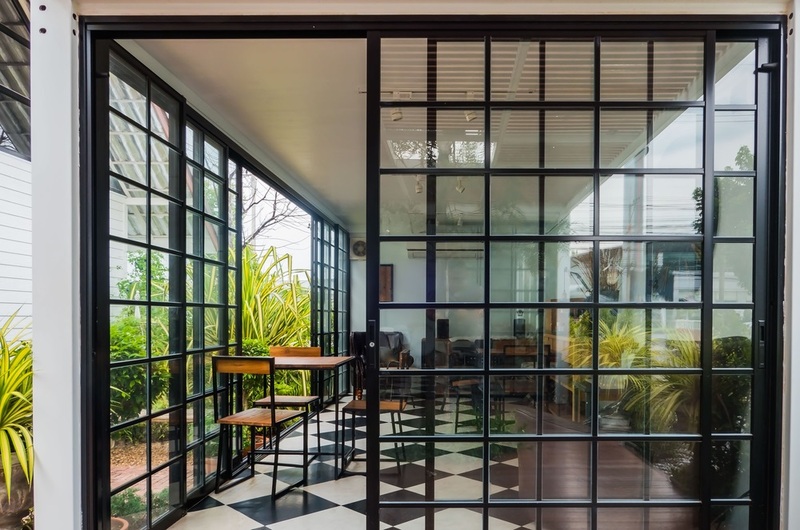 Then, open a coffee shop or cafe in a refurbished shipping container. You can rent or you can build your own. But, make the ambience perfect for all people. If you’re feeling more classy, consider a wine shop with a small tasting area. When you renovate the interiors of the shipping container, make sure that the storage has the right temperature, humidity, and light source. Make it conducive for long-term wine storage. For a more formal business setting, make room for more tables and offer more drinks other than wine. Australians love beer so give them beer! Open a bar out of a shipping container, offer craft beer like Lost Palms Brewery, and set up indoor and outdoor seats. It’s the perfect place to hang out after a hard day’s work. Only interested in crafting beer and distilling liquor? Discard the idea of building a bar and build a drink lab in your backyard instead. Here, you can focus on brewing the next best selling beer or whiskey. Are you running a park or a zoo? Then, consider housing your information centre and ticket booth inside a shipping container. It’s safe and secure. Your staff will feel comfortable inside too, as long as it’s designed well. Starting a tour and travel company? You can use an old shipping container as your office or a resting area for your guides and visitors. Are you running a wildlife or a beach camp? Use a sturdy shipping container as your office. It will protect all your staff, equipment, and important documents. Yup. You can stack multiple containers and turn each one into a sustainable hotel room that travellers will love. Cafeteria of a shipping container dormitory. Similarly, you could make each container into a rental space for students. This is a wise business to do near universities. You don’t need an ultra-wide space to build a salon. Keep the interiors comfortable, furnished it with space saving furniture, and put up a large mirror. This is similar to the previous one, but you’re more focused on manicures, pedicures, and nail art. If you want your spa business to succeed, put it in the best location possible. 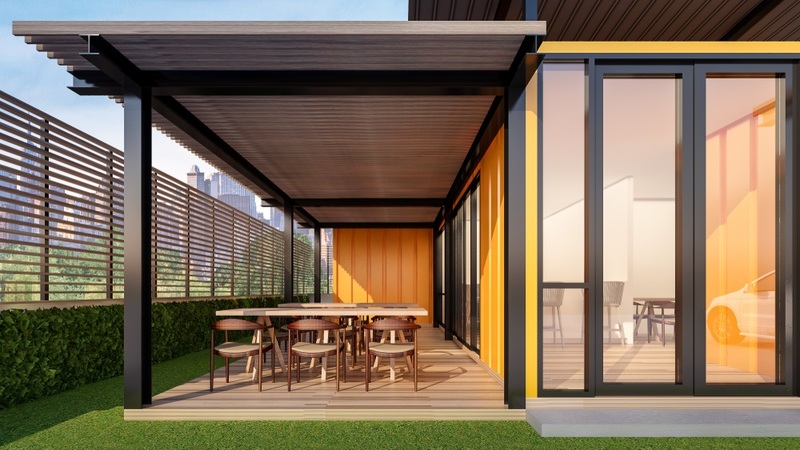 House it in a beautiful and instagrammable shipping container. Physical therapists who want to build their own clinics can renovate old shipping containers and turn it into their precious clinic. Providing service outside the hospitals they serve can help increase their income. Are you a creator of bath and body products? A renovated shipping container can be your own backyard lab where you can formulate and test your products. Similarly, candle makers and wax artist can use shipping containers to build their workshop. From a hobby, pottery can become a serious business if you invest in a studio where you can practice. You can use a shipping container studio to display your work too. Carpenters! You can refinish wood products and plan your wooden projects inside your shipping container office. Similarly, blacksmiths and metal artists can use the space to create metal products or work on a custom metalwork. Love DIY? Are you an arts and craft person? Are you selling your handmade work on sites like Etsy? Well, you can use the shipping container home office where you craft the item and send it to the buyer. If you’re able to sew and measure clothes effectively, you can start an alterations business where people come to you for custom fit clothes. Some pet groomers have clinics on wheels. Renovated shipping containers are larger than custom vans, therefore you can set up this kind of business here. Architects, designers, and product suppliers can use shipping containers to show off their products and services to their clients. This one is perfect for family communities in the suburbs. Kids with broken bikes can easily have their two-wheelers repaired in the neighbourhood. Are you running an outdoor barbecue? You can use a shipping container to store equipment that you don’t want to bring indoors like firewood and fuel. Are you trying to make your community clean and garbage-free? Invest in a few recycling machines and house them inside a renovated shipping container. Welcome everyone in your community to recycle their plastic trash. This is another small business that you can do without leaving the comfort of your own home. If you’re a skilled IT of technician, open a workroom in your backyard and welcome people who want their devices fixed. Similarly, you could use the space to refurbish old smartphones that you can sell online. A shipping container home can also serve as a home-based tutoring service for teachers. Students can come to the teacher for a one-on-one or small group session. As a personal trainer, you can even set up a small gym or workout facility inside a refurbished shipping container and train your clients there. Some people will like this, because it’s not like the crowded gyms in the city. Similarly, you could offer small yoga classes to your neighbours and to private clients. Music is another subject that you can teach to students on a one-on-one or small group in a shipping container classroom. Ensure the acoustics of the walls and you could teach piano, voice, or another musical instrument without disturbing your neighbours. You could also use the container as an office space where you meet with clients if both of you don’t feel like meeting in a restaurant or if you need to do hands-on work. Shipping containers are storage units, therefore you can do a storage business. Set up a bunch of them on your commercial property and offer storage solutions to businesses and families. If you’re planning to turn a shipping container into an awesome business, make sure it’s 100% human-friendly! You’re gonna stay and entertain clients here. Make it look like a legit business. Exert effort to make it look good, presentable, and fit for the nature of your business. We, at Superdraft, can help you design and renovate shipping containers. You can check our portfolio for similar projects or contact us to get an obligation-free quote. Find shipping container commercial architects in Melbourne.